So this is tricky. State Farm is a sponsor of The MMQB, and it feels a little cheesy to have a State Farm commercial in the lead of this column, but what would you do after watching football all weekend, and seeing the commercial with Randall Cobb scoring a touchdown in practice on a lovely throw from Aaron Rodgers, and Cobb calling to Rodgers, “Bro! Your stuff is on fire!” Seeing it 10 times, minimum. And then actually being on the phone with Cobb after Rodgers continued the hottest streak of his life to beat the Giants in their wild-card game Sunday, throwing three of his four touchdown passes to Cobb. Two players owned wild-card weekend, and I found myself wondering Sunday night what was coursing through the minds of the Dallas Cowboys and the Kansas City Chiefs as they watched Sunday’s playoff games. Aaron Rodgers and Randall Cobb connected five times for 116 yards and three touchdowns against the Giants. What was Andy Reid thinking watching Le’Veon Bell steamroll the Dolphins on 10 straight running plays in the first half of a 30-12 rout? What was Jason Garrett thinking as Aaron Rodgers lay waste to the stingiest defense in the league over the past six weeks, putting up four touchdowns in a much more surprising 38-13 romp? “It must be a scary sight to watch us right now,” Cobb said. Green Bay has won seven in a row, and Pittsburgh eight. They’re both scary right now. As are Bell and Rodgers. In the 97th season of the NFL, with one of the biggest collections of shiny offensive stars ever populating the postseason, no back is playing better than Bell, no quarterback playing better than Rodgers. Next Sunday, Bell goes to Kansas City and Rodgers to Dallas. That’s the Sunday doubleheader, and if recent form holds, it could be one of the best playoff days in the NFL in years. Some coaches in the interview process are getting hot (Josh McDaniels, Anthony Lynn) as six teams jockey for new head men. More about that lower in the column. … A legend steps aside, and Tom Brady says, “There will never be anybody like him ever again.” More about that Tuesday at The MMQB. … The MVP race might not be much of a race. More about that, too, lower in the column. But now for the men of the weekend, and maybe the men of the second half of the season. Rodgers is on a sick 22-to-0 touchdown-to-interception streak since Nov. 20. Bell has rushed for 1,002 yards since Nov. 20. What they’ve done since Thanksgiving week is pretty absurd. *Bell was held out of the Steelers’ Week 17 win over Cleveland, so that result is not included here. What’s compelling about each case: Opponents know each man is coming, and opponents can do nothing about it. Take Bell’s game against the Dolphins on Sunday, and take his style of play. Watch the man. He’s got the oddest rushing style in football today. “The Great Hesitator,” Phil Simms called him on CBS, and that’s just about perfect. Usually, Bell lines up as the classic I-back, seven yards deep, and when he takes a handoff from Ben Roethlisberger, he’ll take a couple of jab steps toward a hole and almost stop in his tracks. Denver, under Mike Shanahan, had a one-cut running style; the back was told to hit up in the hole immediately—that charging into the hole was the one cut. Most coaches decry what they call pussyfooting. You’ll hear coaches sometimes yell at their backs to hit it up in there, don’t wait, get what you can. But Bell figures he’s running behind such a great tactical line that eventually he’s going to see a good crease. So he waits longer than other backs. It’s working. His last seven games, on the ground: 146 yards, 120, 118, 236, 93, 122 and 167. How does that factor in this weekend? Kansas City’s giving up 4.4 yards per rush this year, and they’re 26th in the league in rushing defense. So that’s why there might be some alarm bells in the Chiefs’ defensive meetings this week. 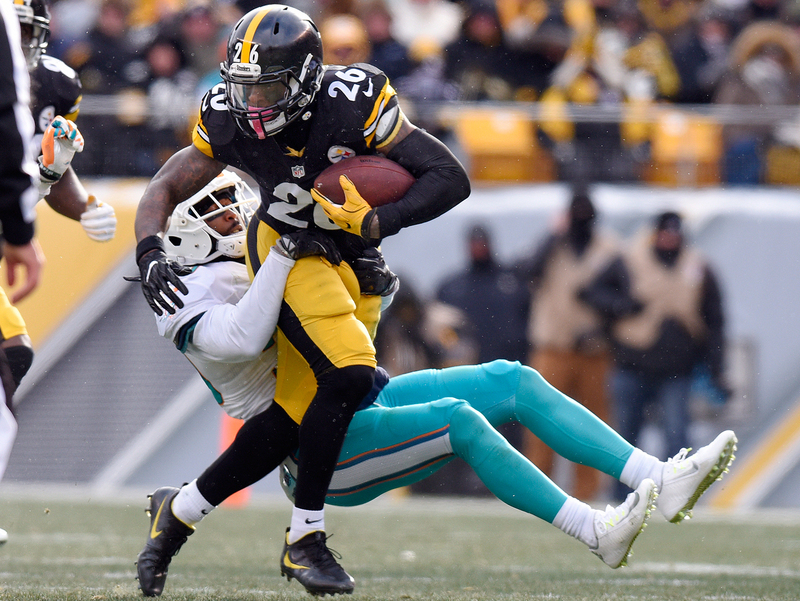 Le’Veon Bell’s 167 rushing yards against the Dolphins set a new Steelers franchise record for the postseason. Now for Rodgers. The Giants were stifling him and the Green Bay offense through the first 25 minutes (Rodgers: 5 of 13 for 38 yards, five minutes before halftime). Then he made one of the most Rodgers-like plays of his life. At the Giants’ five near the two-minute warning, he took a snap and bobbed and weaved against a three-man New York rush, with a fourth player, Damon Harrison, rushing from a contain spot late in the play. (Maybe the Giants should have sent four or five, but you pick your poison here; rushing more could well have given Rodgers less time to find a man but more space in which to throw a dart.) Rodgers moved up, bounced in the pocket, jittered to the right, looked to his left. Three, four, five, six seconds. Now he began moving left, hounded by Harrison, and saw a sliver of space outside Davante Adams, covered closely by Giants DB Coty Sensabaugh. How’d he fit that ball into a tiny window three feet to the outside of a diving Adams? He just did. Two minutes later, Pack ball at the New York 42. Last play of the half. Everybody knows the Hail Mary’s coming. Five Giants surround three Packers in the end zone, and Rodgers, as he does on these throws, heaves a moon shot. He said, “The high arc is by design. 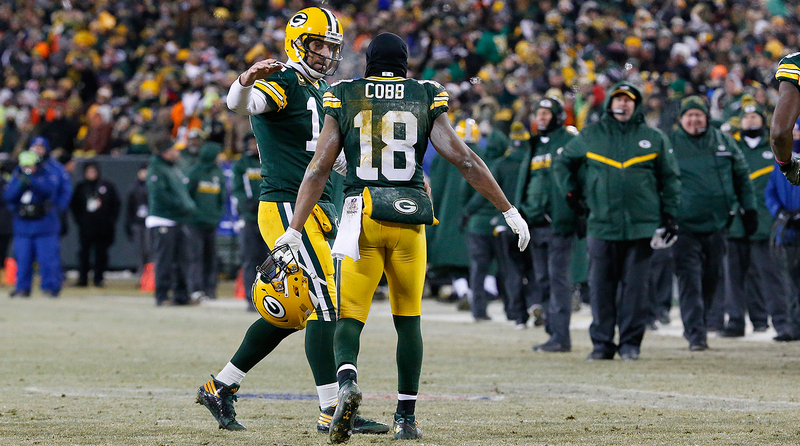 I want to make sure those guys have enough chance to get down there and jump for it.” Randall Cobb’s job, as one of the smaller guys, is to be the muscle for “the jumper”—Adams. “I’m supposed to get in position to box out at least one guy and let the jumper be the jumper, give him a fairly clean place to jump.” Here came the ball, a little deeper than Adams and Jeff Janis and Cobb through it would be thrown. Right in the back of the end zone, in fact. Four Giants were clustered around Adams, and Cobb hung near the end line and had little competition for it. “The ball comes down,” Cobb said, “and it’s right to me.” The Giants played it poorly, obviously, playing the men rather than the ball. But that deflated the visitors and inflated the Packers. Green Bay led 14-6 at the half, and the Giants never led again. “We’re a very dangerous team right now,” Cobb said. Garrett and the Cowboys saw that Sunday. The Patriots shut out the Texans, 27-0, in Week 3 and opened as 16-point favorites for Saturday’s rematch in the divisional playoffs. • NFC: Seattle (11-5-1, third seed) at Atlanta (11-5, second seed), Saturday, 4:30 p.m. ET. America still doesn’t know these Falcons. Won a fairly weak division, lost to San Diego and Tampa Bay at home, handed Kansas City a win—also at home. But Atlanta scored 33 points or more in 10 of 16 games, Matt Ryan has so many weapons he doesn’t miss Julio Jones when he’s out, and the two-headed running attack (Devonta Freeman, Tevin Coleman) averaged 4.6 yards per carry. When these two teams met in a thrilling October game (Seahawks 26, Falcons 24, in Seattle), the Falcons were a non-pass-interference call in the final minute from a good chance to win. The Atlanta Weaponry Factoid I like to use is that Taylor Gabriel out-touchdowned the great Julio Jones, 7-6, this year. So Seattle will have a tough time shutting down the league’s highest-scoring offense. My advice for the Seahawks: play clockball. Try to keep Atlanta to eight or nine possessions by using Thomas Rawls as much as he was used in the wild-card win over Detroit. I like Atlanta in this first game of divisional weekend, but I could see Seattle continuing the momentum it started with the rout of Detroit. • AFC: Houston (10-7, fourth seed) at New England (14-2, first seed), Saturday, 8:15 p.m. ET. This is the 14th playoff appearance for the Belichick/Brady Patriots, and they’ve played at home to open the playoffs every time. And only once (I’ve checked) has the matchup been more lopsided heading into game time—the 2011 divisional game against the 9-8 Broncos, quarterbacked by Tim Tebow. New England won that night, 45-10. It’s so hard to envision the Texans making this a close game. 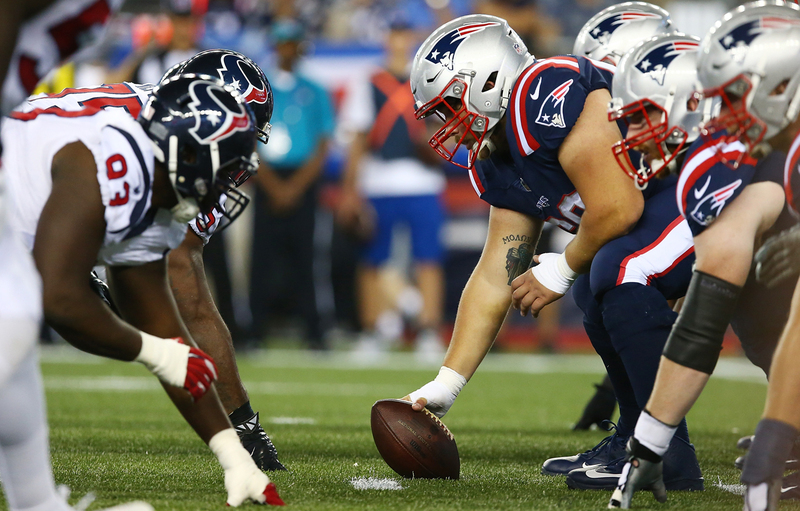 Consider this: In Week 3, third-string Patriots quarterback Jacoby Brissett, a rookie, started his first NFL game, damaged a ligament in his throwing thumb in the third quarter, and the Patriots embarrassed the Texans and Brock Osweiler 27-0. Now? Osweiler has a tendency to try too hard to be perfect, on and off the field, and the good Osweiler showing up is the only slight prayer the Texans have. 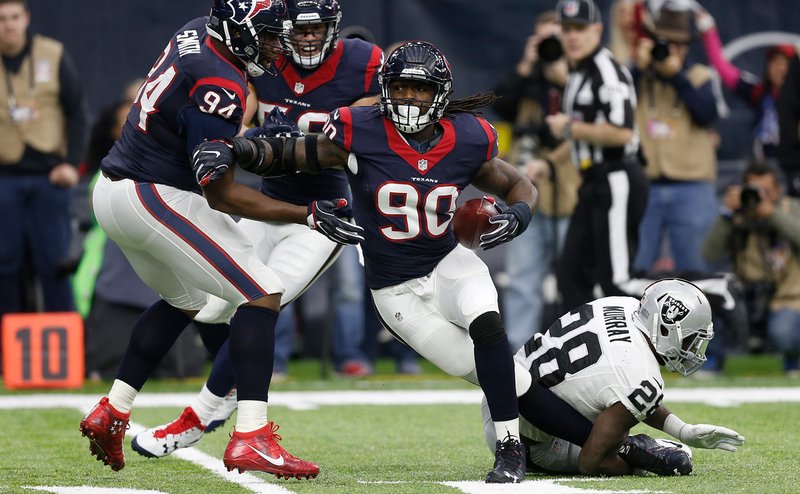 “The next opponent is going to be a tall task, which we understand,” Bill O’Brien said before he knew the matchup. “Our MO is to make it a game in the fourth quarter. When we’ve done that, we’ve had a good chance this season.” Perhaps. But even facing a very good defense, the Tom Brady NFL Revenge Tour should have a comfy postseason debut at Gillette Stadium. Vegas agrees. The early line is New England by 16. • AFC: Pittsburgh (12-5, third seed) at Kansas City (12-4, second seed), Sunday, 1:05 p.m. ET. In their first meeting this year, at Heinz Field in October, Kansas City went punt-fumble-interception-punt-punt-punt in its first six series. Pittsburgh’s first six: punt-TD-TD-TD-punt-TD. After 36 minutes, it was 36-0 Pittsburgh. “First game means nothing,” Steelers safety Mike Mitchell said Sunday. “We’re not booking this. They’re a two seed for a reason.” Sounds good, but we’ll see if the Steelers can believe it as the week goes on. Sometimes when good teams play, the game can get away from one of them. And the Steelers’ first two touchdown drives in that October game—32 yards and four yards—were off turnovers. This time it’s going to be vital for Kansas City to possess the ball and have some long drives; the Steelers’ offense is so dangerous right now, and it almost doesn’t matter if they’ve got to move it throwing or running. The Chiefs have held the ball longer than 34 minutes only three times in 16 games this year—and this week that could be the biggest factor of them all. Long Steeler drives, plus 11 or 12 possessions for them, could decide the game. • NFC: Green Bay (11-6, fourth seed) at Dallas (13-3, first seed), Sunday, 4:40 p.m. ET. Good stat overnight from Pro Football Focus: When the Cowboys beat Green Bay at Lambeau in October, they did it in spite of a poor pass-rush on Aaron Rodgers—and, quite possibly, because Rodgers was playing poorly at the time. Dallas got pressure on just five of 45 Rodgers’ pass drops, according to PFF. If that happens this time, the pressure will be on Dak Prescott and Ezekiel Elliott to own this game, or the Cowboys could have a stunningly early playoff exit. The strategy for Dallas here would be the same as for Seattle. Control the ball and limit Green Bay’s possessions. The Packers’ offensive line has been terrific all season, and tackle Bryan Bulaga and David Bakhtiari are healthy and playing very well. I do not envy Cowboys defensive coordinator Rod Marinelli. To win the Super Bowl, he might have to beat three of the top five candidates for the 2016 MVP: Rodgers in the divisional round, Matt Ryan in the NFC title game (if the favored Falcons win this weekend) and Tom Brady in the Super Bowl (if the Patriots come out of the AFC). Suppose the favored Ryan wins this year’s MVP. Think of that: Has any team ever beaten three current/former MVPs to get to the Super Bowl? 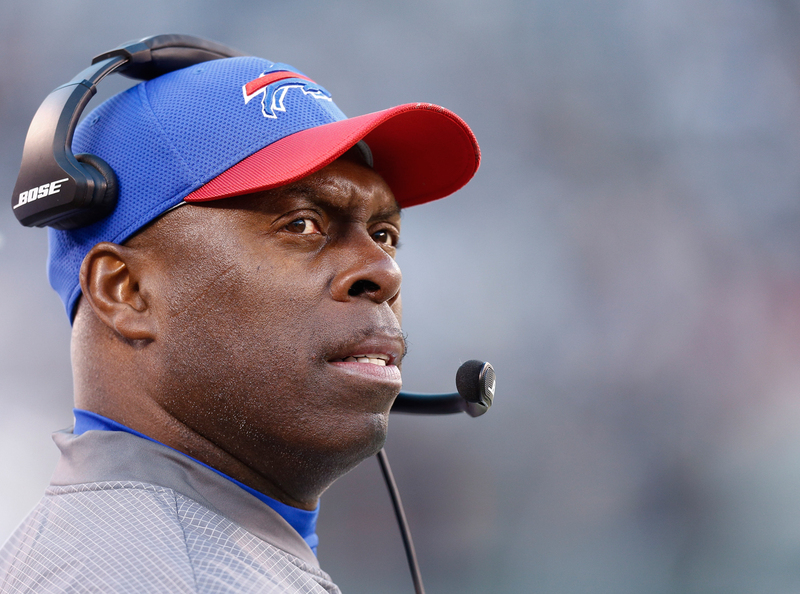 Bills interim coach Anthony Lynn has impressed teams during the interview process. • I’m hearing the Bills and Rams were feeling good about the prospects of Buffalo interim coach Anthony Lynn. Organized and a commanding presence, I heard from one club official after his interview. Lynn’s best chance might be if Bill O’Brien stays in Houston and Buffalo ownership gives a shot to a coach universally liked and respected in the building. • On Saturday, New England offensive coordinator Josh McDaniels interviewed with the Jaguars at 7 a.m. in Foxboro, the Rams at noon in Foxboro, and the 49ers at 4 in Foxboro. For some teams in the process, it seems like McDaniels is the No. 1 guy on their list. But we’re still early in the process. Very early. There’s no coach out there whom teams are racing to hire. But McDaniels had a good Saturday. Teams came away impressed, particularly the Jaguars. • I’ve heard good things about the 49ers in their interviews. Why? Because they’re willing to import a coach who would be in charge of reinventing the culture in San Francisco. And they’re willing to be patient. By patient, I mean willing to give a long-term contract to a coach, listen to his recommendation for GM, and steel the locals that this is going to be a significant rebuild. Smart. There’s no other way to do it and to have a chance. • Re the MVP: The MMQB’s awards had Matt Ryan winning. We polled media and football lovers (like John Legend) and asked for their top five at MVP. Ryan ended up with 17 of 31 first-place votes. Tom Brady was next with six. I had my top five this way: Ryan, Derek Carr, Tom Brady, Dak Prescott, Aaron Rodgers. Odell Beckham and the Giants missed opportunities to make plays against Green Bay. New York Giants: Odell Beckham dropped one pass and didn’t catch two others that were in his hemisphere in Green Bay. We saw. But I simply do not correlate it to watching the sun come up on a party boat in Miami six days before the game. It’s a lazy story angle, to me. Would I prefer that every night during the week Beckham be in bed at 11? Yes. Do I want to control the off-days of 24-year-olds? No. 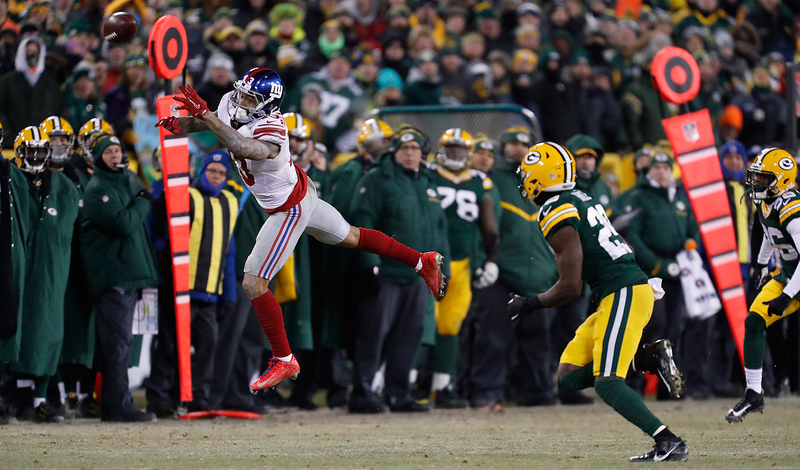 The Giants lost because Aaron Rodgers is playing out of his mind, because vital cornerback Dominique Rodgers-Cromartie got hurt early and was a non-factor—and maybe next is the fact that Beckham should have been better. … Eli Manning turned 36 six days ago. Clock is ticking on his life in football. The 2017 season is a vital one, with this defense growing into a very good one, for Manning. It might be his last, best chance to win a third ring. … Giants have devoted a lot of draft capital to the offensive line recently. But they’ve got to find a tackle in this draft, or in free agency. They’re too shaky on the edge. Miami: Defensive coordinator Vance Joseph is a candidate for multiple head-coaching jobs, and there’s no question he’s got a real shot to be the Broncos’ next coach. 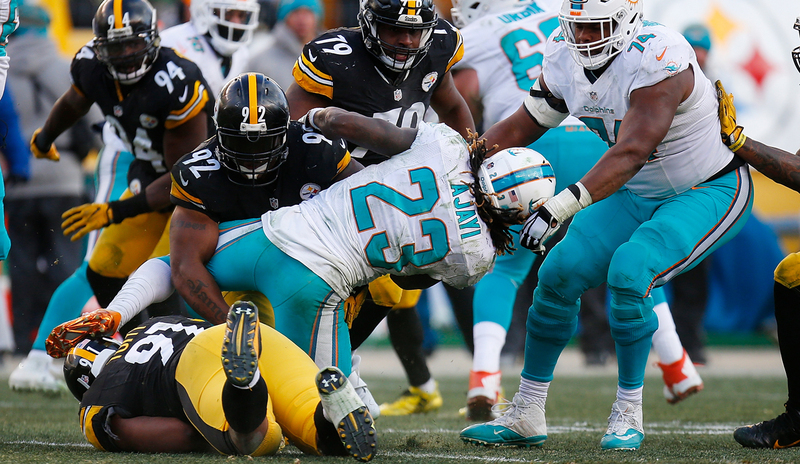 But he followed up a year in which the Dolphins were 29th in the league in team defense with this clunker: allowing the Steelers 90-yard, 85-yard and 83-yard touchdown drives in the first 20 minutes at Pittsburgh. … Matt Moore, you have my admiration. … Amazing to me with a Dolphins front anchored by Ndamukong Suh that the Steelers can shred it for 286 first-half yards and essentially end the game … All in all, a very good year for Miami, and the Dolphins found the right coach in Adam Gase. But the team has a way to go to be a serious challenger for AFC East supremacy. Oakland: Now you know why I voted Derek Carr second on my MVP ballot. It’s not about the weakness of the backups, nor is it about stats—it’s about his meaning to the team and the importance of his presence … Offensive coordinator Bill Musgrave did Connor Cook no favors early in Houston, all but telegraphing to the Texans defense: WE’RE ONLY THROWING SCREENS AND CHECKDOWNS BECAUSE THE ROOKIE QUARTERBACK IS SCARED, AND SO ARE WE. First three passes: short left incomplete, short left gain of one, screen left batted and picked off by Jadeveon Clowney. If Connor Cook’s in the lineup and he’s playing quarterback, let him play quarterback the way he was raised to play … No Raider fan should be discouraged this morning. Every arrow is pointing up for this franchise right now. Carr would have won that game (at least it would have been a shootout) and would have given the Raiders a good chance in any game they’d have played this postseason. Detroit: “Some things are inexplicable,” coach Jim Caldwell said after the 26-6 loss to Seattle, referring to the dropped passes, the Anquan Boldin meltdown and the general poor game the Lions played. It doesn’t reflect well on the coach, and the coaching staff, to see that level of play in the biggest game of the year, but GM Bob Quinn has announced that Caldwell will return in 2017. Quinn may not have fired (and maybe should not fire) Caldwell. Maybe Quinn should have just said, With Matthew Stafford hurt, it’s all a mulligan now anyway. But why make that call after backing into the playoffs, losing three vital games in a row down the stretch—and before an awful-looking playoff performance? … So strange to see a rock-solid guy like Anquan Boldin go nuts the way he did. For his sake, I hope that’s not his last game … We never talk about Glover Quin as a top safety, but he saved a touchdown with an end-zone pass deflection and played very well on the back end. 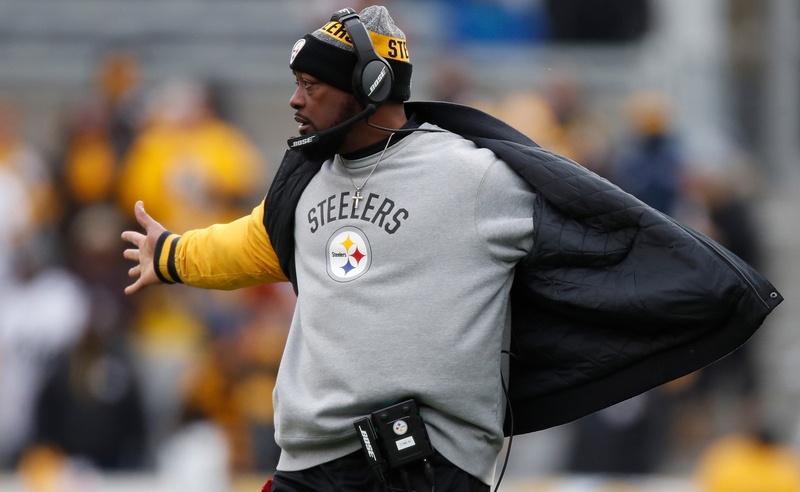 Mike Tomlin is now 12-6 in the playoffs over his 10 seasons as Steelers head coach. —Pittsburgh coach Mike Tomlin, on Sunday’s playoff rematch with Kansas City. The Steelers won the first meeting by 29 points. —Jon Gruden on the ESPN telecast of Oakland-Houston Saturday. In 2000, Gruden’s third year as Raiders coach, Oakland drafted Sebastian Janikowski in the first round and Shane Lechler in the fifth round. That’s the year New England took Brady in the sixth round. —Oakland quarterback Derek Carr, wired for sound by NFL Films in the Raiders’ Dec. 24 win over Indianapolis, on the ground with a broken leg late in the game, motioning to the sideline for medics to come get him. The second quote, Carr to backup quarterback Matt McGloin, came when McGloin passed him on the field coming in to finish the game. That kind of drama is why you wire players. —Seattle wide receiver Doug Baldwin on Richard Sherman, in Robert Klemko’s story for The MMQB on the outspoken and emotional Sherman’s sideline outbursts this year. Sherman is not apologizing for them. —Pittsburgh linebacker James Harrison, to Andrea Kremer on NFL Network on Sunday, on the 2015 Al Jazeera report that he used PEDs. Aaron Rodgers, quarterback, Green Bay. That 38-13 win over the Giants was a ridiculous game. How do you figure, particularly against a team with the kind of defensive fortitude and cover ability as New York, that Rodgers is going to have four touchdowns, no picks, no turnovers and throw for 362 … after struggling for the first 25 minutes? We are watching one of the great quarterbacks of our lives, with the kind of pocket presence and feel for the rush and touch on his throws that are second to none in football today—which is saying something, because Tom Brady is still playing, and playing remarkably well. Justin Britt, center, Seattle. This is not to diminish the great game of Thomas Rawls (27 carries, 161 rushing yards). The interior Seattle line, as embattled a line as there is in football, was superb in opening holes and driving the Lions off the ball in their 177-rushing-yards performance in Seattle’s dominant win. Britt made the key block on three big Rawls runs, and was aided by two big clear-out blocks by left guard Mark Glowinski. This is the formula Seattle used in the Marshawn Lynch Era—win time of possession (Seattle had the ball for 36:39), give Russell Wilson enough time to make plays (mostly, he had that time), and don’t turn it over. Of all the teams that won this weekend, the single most surprising element, in a positive way, was the performance of the Seattle offensive line. Britt, the Seahawks’ second-round pick in 2014, was huge in that performance. For many college football players, particularly those at the highest level of the game, it used to be said that once they reached pro football, they would hit the rookie wall at 11 or 12 games, because that’s all they played in college. Rookie Colts center Ryan Kelly, from Alabama, played 16 games this year, and including training camp, his year lasted 22.5 weeks from the first day of summer practice . Alabama football players play their 15th game tonight in the national title game against Clemson, and their season lasted 23.5 weeks. An asterisk there: In December, the Tide had a week off for rest and for finals between the SEC title game and the playoff game against Washington. But you get the point: For the players coming off the best college teams, there should be no more rookie wall, because the college season is the exact same length as the NFL. Two Bobcats spoke late Sunday afternoon. At the end of our conversation, just before hanging up, Steelers safety Mike Mitchell (Ohio University class of 2009) said to Peter King (Ohio University class of 1979): “Good talking to you, Mr. King. OU, Oh Yeah.” Then he was gone. That wasn’t a thing when I was in Athens. Mike Mitchell’s birthday: June 10, 1987. 1. Packers OT Bryan Bulaga. His sound pass-protection against the Giants was one of the key reasons Aaron Rodgers was able to throw for four touchdowns and control the game in the last 35 minutes. Bulaga allowed zero sacks and one hurry on his 46 pass-blocking snaps and ranked number one among all tackles this weekend. 2. Steelers linebacker Ryan Shazier. He brought his normal frenetic style of play into the playoffs and was all over the field against the Dolphins. Shazier had two hurries on his nine pass-rush snaps, allowed three catches for just 19 yards and intercepted a pass. 3. Texans cornerback A.J. Bouye. He was on the field for 52 coverage snaps against the Raiders and had an amazing game. Bouye was thrown at seven times by Raiders quarterback Connor Cook and didn’t allow a single completion. He intercepted a pass and allowed a passer rating of 0.0. Go here to access PFF’s grades on every NFL player. I was in Vegas with three buddies for a guys weekend, and we posted up at Lagasse’s Stadium in the Palazzo for both Saturday games. Watching the playoffs in Vegas is a communal experience, particularly at a sports book. Camaraderie is king. There are diehard fans on both sides of a game, for sure, but the gambling action ratchets things up several notches and turns relatively meaningless moments into loud cheers/groans as betting lines are impacted. Strangers quickly become friends. Lagasse’s erupted, as fans with Seahawks and Lions and Texans and Raiders jerseys all enjoyed the dig at the team everyone loves to hate. Especially in Vegas, it’s more fun to root for the underdog. In his Football Lifestyle column this Friday, Bonvissuto will be writing a Guide to Watching Playoff Football in Vegas. Have any tips or advice on how to make the most of the experience? Drop him a note on email or Twitter. The ESPN host, comparing the 1990s Dallas dynasty to today’s Giants. I never felt so nervous watching a football game. This week: A playoff preview with NFL analyst (and former NFL quarterback and 18-month Patriots offensive quality control coach) Chris Simms; Buffalo guard Richie Incognito; and Giants linebacker and defensive captain Jonathan Casillas. • Simms on his year as a coaching assistant in New England, and on Bill Belichick: “I was doing all the dirty work, breaking down all the film, supplying the coaches with information to start their game plan. And then I was in charge of northeast scouting, making tapes. People think I don’t like New England, but you are critical of the teams you like the most, right? I am a huge New England fan. It was a great experience being there, and I learned so much and I got an inside look of why they are the greatest franchise in the last 20 years and maybe in the history of the NFL. Coming this week on the podcast: Atlanta quarterback and MVP candidate Matt Ryan, and Pro Football Talk founder/editor and NBC “Football Night in America” analyst Mike Florio. a. Seems like a never-ending tradition: The early Saturday game feels like the JV game. b. Despite the Giants’ surrendering 38 points Sunday, highlighting some depth issues in the secondary, GM Jerry Reese had one of the best free-agency seasons in history in 2016.
c. Of every team left in the playoffs, the Steelers are best suited to win on frigid days, with a strong-armed quarterback, a patient and broiling running back, and more than one reliable receiver. (I’m counting Eli Rogers). d. I am 59 years old; I was 6 months old when the Lions won their last road playoff game. I don’t think that says good things for the Detroit football club. e. Looks like it’s over for new Seahawk Devin Hester. The greatest punt-returner of our day, 34, signaled for a fair catch and caught a first-quarter punt at the Seattle 12-yard line with the two closest Lions each eight yards away. f. I was one of those, incorrectly, with a shovel, throwing dirt on Jadeveon Clowney’s career last summer. g. I disagree with Cris Collinsworth on his people-didn’t-appreciate-Marshawn Lynch-enough point Saturday night. People appreciated him plenty and miss him very much. h. It’s just not acceptable, and should be cause for Seattle GM John Schneider to bring kicking competition to training camp next year, for Seattle kicker Steven Hauschka to miss seven extra points—seven 33-yard field goals—in 17 games. i. The Dolphins are two corners away from being a threat to win multiple January games, but they’re not the only team that can say that. j. Every time I watch Bobby Wagner play (I sound like a broken record), I’m impressed with his instincts and his Ray Lewis-like sideline-to-sideline intelligence and athleticism. 2. I think I like the Gregg Williams hire as defensive coordinator for Hue Jackson and the Browns. It’s not just because the Rams were ninth in team defense this year, because they had some awful games. But it’s because Williams is not going to stand for 4.6 yards per rush (Cleveland’s porous defensive number this year) or 36 passing touchdowns (which Cleveland allowed this year). He’s going to make mediocrity uncomfortable. He’ll fire people (if he can), or at least bench them. If Jamie Collins re-signs, Williams will challenge him to get the lack of discipline out of his game. Good pick by Hue Jackson. 3. I think I’m sure Tampa Bay coach Dirk Koetter won points in his own locker room by saying the team would have competition for second-round kicker Roberto Aguayo in training camp next summer. GM Jason Licht traded into the second round to pick Aguayo, and he was the worst kicker in the league (among kickers who played the full season with their teams); he was a 71-percent kicker, and hit just four of 10 from beyond 40 yards. “Our field-goal percentage this year was not good enough,” Koetter said last week. “Jason [Licht] and I have talked, and I think it’s already proven that we have no problem moving on from a draft choice and playing someone who wasn’t drafted.” Good lesson for Licht: Let’s say the four best kickers of the current era (just my opinion) are Adam Vinatieri, Dan Bailey, Stephen Gostkowski and Justin Tucker. One was drafted. You can find kickers—and great kickers—on the street, or late in the draft. You certainly shouldn’t trade up to pick one in the second round. 4. I think owner Bob McNair tried to put out the fire of the tenuousness of Bill O’Brien’s job (“There’s nothing to it; I’m not going to fire him”) Saturday evening, and assured Houston reporters that O’Brien will return for his fourth season in 2017. I asked O’Brien about it after the game. “I don’t know where it’s coming from, honestly,” he said. “That’s probably a question for someone else. All those things out there, I’m not familiar where they’ve originated from, and I certainly want to finish what we started and bring a championship to Houston. That’s why I came here.” No one knows exactly what the tenor of feelings is inside the building in Houston, but when I think about the Texans and the culture led by owner Bob McNair, I think of civility and utmost respect. I think how well Gary Kubiak must have fit in there, and how comfortable McNair and GM Rick Smith must have been with him. O’Brien’s got a bit of a growling side, a tough edge, and he’s going to sometimes rankle people if getting along is of paramount importance. In my opinion, losing O’Brien would be a huge mistake. 5. I think O’Brien would be a strong candidate in at least two of the six current openings. But as one coach-seeking team decision-maker told me Saturday: “Obviously that’s an interesting candidate, but we’d want to know why that thing blew up, if it does. We’d want to know what he [O’Brien] is like to work with.” I’ll tell you what he’s like, according to those who work with him: He’s going to make it unpleasant if you lose, or if you’re not playing well. 6. I think this doesn’t speak volumes; it shouts volumes. Christian Hackenberg was the 51st pick in the 2016 NFL Draft, 84 spots (and almost three full rounds) in front of Dak Prescott. And Jets GM Mike Maccagnan was asked Thursday if Hackenberg has developed enough in 2016 to compete for the starting job in 2017. Now, Maccagnan was not asked if Hackenberg was the starter entering 2017, or whether he expected Hackenberg would start in 2017. He was asked if Hackenberg “has developed enough to compete for the starting job” next season. Maccagnan said: “From where he was initially, he has made progress. He has improved. This will be a big offseason for him and we’ll probably have a better feel for that when we go into training camp next year.” Man, has Hackenberg learned how to put on a helmet yet? 8. I think you don’t win starting quarterback jobs in the NFL during January press conferences. And Hackenberg obviously will sink or swim on his own starting in the Jets’ offseason program in April. But some quarterback prospects during their first year or two engender comments about looking good in practice, and pushing for playing time. I never heard once all season about how impressive Hackenberg looked. 9. I think Nick Saban won’t be going to Indianapolis. Makes a lot of sense on the surface, but it doesn’t look like the Sabans will be moving to central Indiana, regardless of outcome in Tampa tonight. a. Good piece while you’re waiting for the national championship game tonight, on the pro prospects of Clemson quarterback DeShaun Watson, by SI’s Pete Thamel. b. I’d love to give you a prediction on the game tonight. But I haven’t seen enough of either team to say anything about it. Really interested to watch DeShaun Watson for four quarters, though, after reading Thamel’s piece. c. I walked the dog regularly over the weekend, a couple of times when the wind-chill temperature was under 20. Playing football at 0 degrees wind chill? I don’t see how you can be at your best. For Aaron Rodgers to have one of the best games of the year for a quarterback, when it’s windy and in the single digits? Man, that’s an accomplishment. d. If Murray Chass doesn’t think anyone’s worthy of the Hall of Fame, let him leave his ballot blank. Which he did. e. Beernerdness: I re-tried Namaste, the witbier from Dogfish Head Craft Brewery (Milton, Del. ), and I was glad I did. With a tiny slice of lemon, it’s perfect any time of year. Better in the summer, but I’m getting a little cranky about heavy beers at any time, and so the Namaste was terrific in an Allagash White kind of way. f. This is as worrisome a story as we’ve seen in this country in a while. g. You’re more important than ever, John McCain. Do not back down. He should not be buried now.